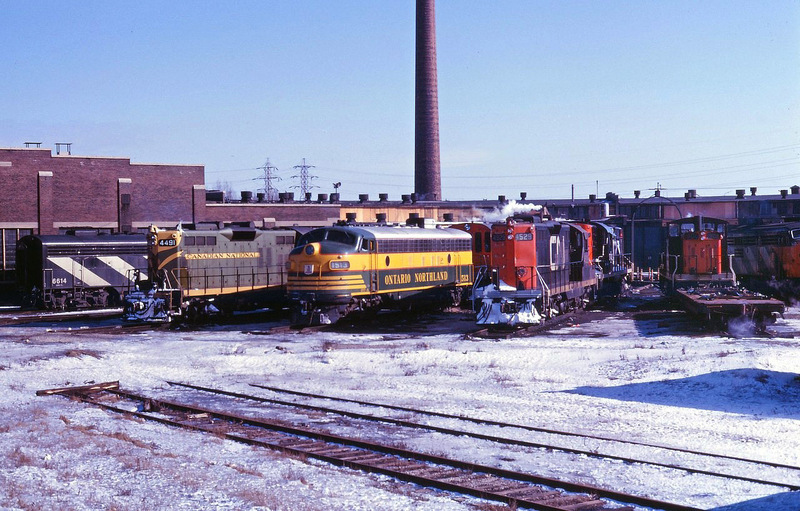 Railpictures.ca - Doug Page Photo: Spadina roundhouse was always a joy to visit…on this trip in January 1967, we see CN F9B 6614, GP9s 4491 and 4529, ON FP7 1513, passenger GMD1 1906, and unidentified 8500 series S13, 3i700 series RS18, and 6700 series FPA4 units. Seems hard to believe today, yet this was routine 50 years ago. | Railpictures.ca – Canadian Railway Photography – photographie ferroviaire Canadienne. Caption: Spadina roundhouse was always a joy to visit...on this trip in January 1967, we see CN F9B 6614, GP9s 4491 and 4529, ON FP7 1513, passenger GMD1 1906, and unidentified 8500 series S13, 3i700 series RS18, and 6700 series FPA4 units. Seems hard to believe today, yet this was routine 50 years ago. This is lovely. A potpourri of motive power and paint that belongs on any model railway circia 1960′s.